We’re trying something new with the CLMOOC this coming week: instead of continuing on with the weekly Make Cycles (which aren’t time-dependent anyway), we are entering a Brake/Break Week – or, as Anna Smith so thoughtfully put it, a Purposeful Pause. In other years of CLMOOC, folks have expressed a need to slow down and have time to go back to what they missed. The flow can be overwhelming at times. In an open learning adventure like CLMOOC, which plays out in many social media spaces, it is easy to lose track of conversations, projects, interactions and more. This week of “pause,” as guided by Jeffrey Keefer, is an opportunity and an experiment. We hope folks will use the chance to do what they need to do, and even catch their breath, and yet still return for our final Make Cycle week, when the theme is celebrating connections. We also hope they use the time for reflection and sharing, just in a different way. 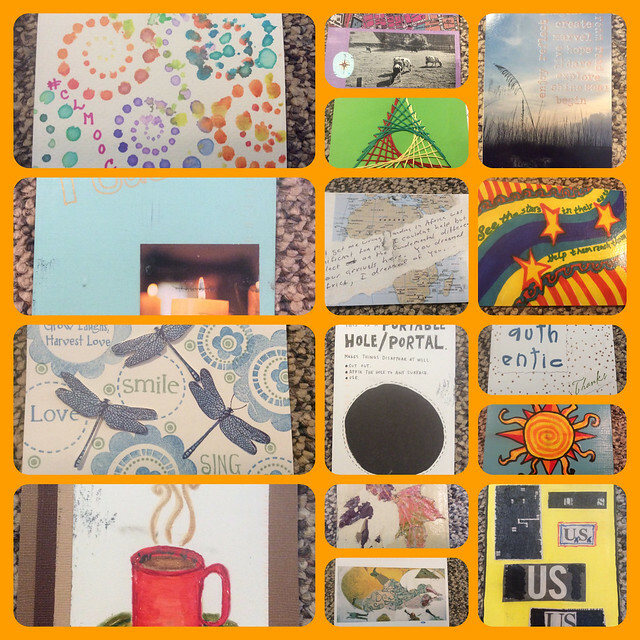 So, this week, as I try to slow down a bit with CLMOOC, I am going to turn my attention to the CLMOOC Postcard Project. This offline adventure began last year as a way to connect folks during the year, via old fashioned writing and letters, and it’s such a lovely gift of a project. I took photos of all of the postcards I have received for a little video. In the coming days, I am going to write and send postcards to all my CLMOOC friends. They will arrive either during the last Make Cycle or afterwards. What will you do be doing?